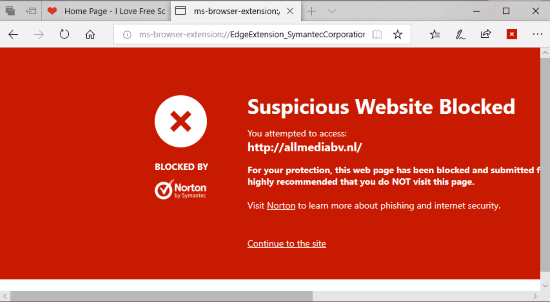 Norton Safe Web extension for Microsoft Edge has been released by Symantec Corporation to prevent users from accessing malicious sites. This is simply a very good extension for Microsoft Edge users because earlier no such safety extension was there. Now, Microsoft Edge browser users will be protected from harmful, suspicious, or malware infected sites. 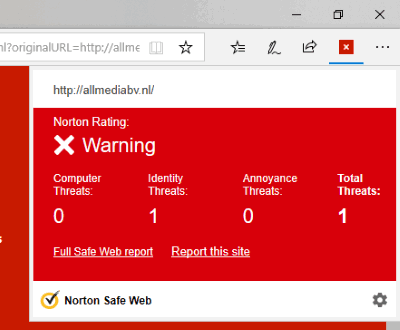 As soon as you try to open some link or access a website which is malicious or suspicious, Norton Safe Web extension will simply block that particular website and show you a warning. In that warning page, it also provides a link to jump to Safe Web page and see the full report related to that particular website. Apart from that, you can also use extension icon to see Norton rating for that specific website. In the screenshot above, you can see Norton Safe Web extension blocked a suspicious website. Though there is option to “Continue to the site“, you shouldn’t use that option unless you’re sure enough. You should check the full report for that website or check Norton Rating using this extension. Step 1: You can find homepage link of this Norton Safe Web Microsoft Edge extension at the end of this review. Step 2: Install the extension and turn it on. You can access Extensions section and turn it on. Step 3: When you will open some website, this extension will protect you silently in the background. If a website is malicious, it will block it. If not, it will let you access that website. The extension icon also shows green tick mark if the website is safe to use. Or else, it will show a red cross icon and also block the website. Step 4: You can also see the Norton rating (safe, warning, etc.) for any website by clicking the icon of this Microsoft Edge browser extension. A pop-up is opened where you will see the total score. The score is based on the computer threats, annoyance threats, and identity threats. 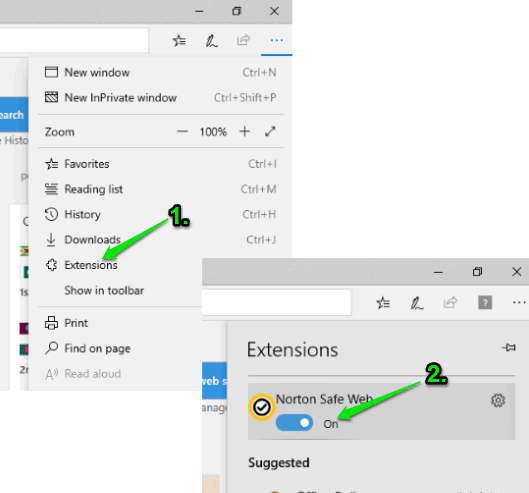 Did you know Microsoft Edge also lets you mute tabs? Google Chrome browser has a similar and built-in feature to block access to malicious sites. That feature is very good but not effective all the time. This extension, on the other hand, is better to use because Norton database about malware infected sites is huge and it makes Microsoft Edge browser safer than before. 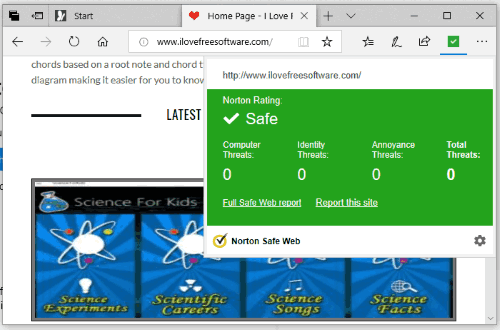 Though anyone can access Norton Safe Web homepage, enter the URL of a website, and check its status, this extension skips all that hassle. While using Microsoft Edge browser, you just need to install it and forget it. The extension will take care of the rest automatically.